The 180 degree folding arrow board is designed to swivel 180 degrees to be visible either from the front or from the back. 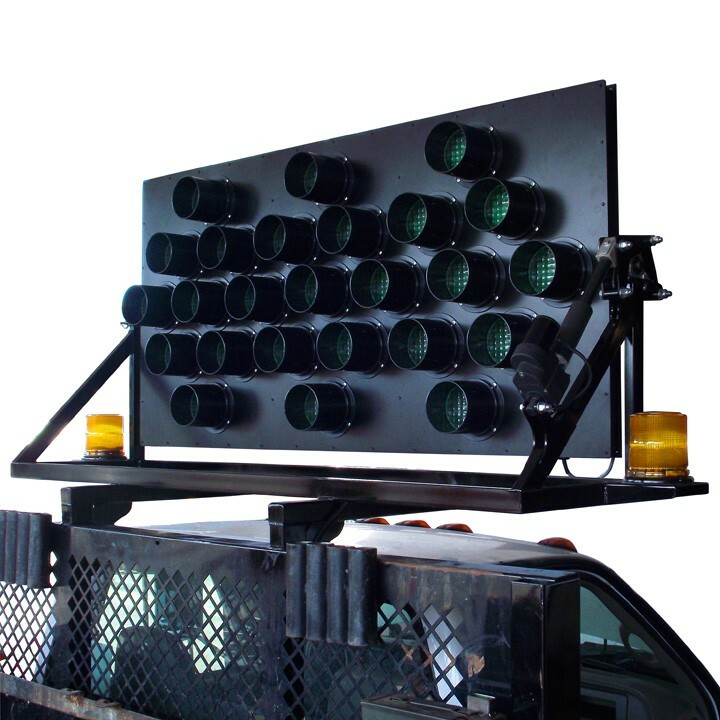 The bright 25 LED lamp display swivels from front to back using controls mounted in the cab of the vehicle. Multiple options are available including color and mounting for warning lights. Truck mounted arrow boards allow you to transform your vehicle into a mobile warning device. Arrow boards can be mounted to almost any vehicle setup. 11 preprogrammed arrow functions are accessible from the cab mounted control box, which means there’s no need to get out of your vehicle to operate the arrow board, especially in hazardous conditions. Having the ability to turn the arrow board face either forward or backward and angle it for best visibility greatly increases your options for positioning your vehicle while still being visible to traffic. Each unit is equipped with an electric actuator controlled from within your vehicle. Manufactured in the U.S.A. to the highest standards, each board is designed to be extremely easy to operate and maintain and provide years of service.